Transform any setting by incorporating the sound of water with the Aquascape Mini Stacked Slate Urn Fountain Kit! The kit includes everything you need to install a beautiful water feature, including an energy-efficient pump and water basin. The lightweight, durable fiberglass-resin fountain provides all of the natural beauty of real rock with the added benefits of fiberglass. The natural rock veneer imitates a natural stacked slate design, will not fade or chip, and ages like real stone, providing the perfect outdoor or indoor fountain for your enjoyment. 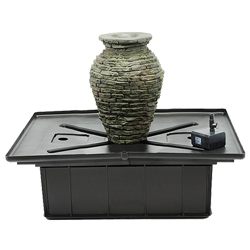 Measuring 18.5" high, the Aquascape Mini Stacked Slate Urn Fountain is paired with a pump and durable AquaBasin Mini.